By throwing himself into auto assembly line work, the United States Marines and graduate school in mathematics, Mike Keefe desperately hoped to suppress his secret nature. But then, in an unguarded moment during Watergate, he found himself drawn to Richard Nixon’s nose. He’s been out of the closet and cartooning ever since. 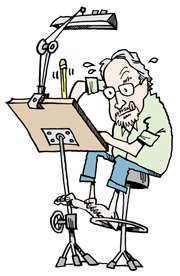 "Mike Keefe was the editorial cartoonist for The Denver Post from 1975 through late 2011. His work continues in syndication and at The Colorado Independent.. Throughout the nineties he was a weekly contributor to USA Today and a regular on America Online. Nationally syndicated, his cartoons have appeared in Europe, Asia and in most major U.S. news magazines and hundreds of newspapers across the country. Keefe’s animations have appeared on broadcast TV, the internet and CD-ROM magazines. He has won top honors in the Fischetti, National Headliners Club, Society of Professional Journalists and Best of the West contests. He was a John S. Knight Fellow at Stanford University and is a past president of the Association of American Editorial Cartoonists. He was a juror for the 1997 and 1998 Pulitzer Prizes in Journalism. He won the Pulitzer himself in 2011. Keefe is the author of the books Running Awry, Keefe-Kebab and The Ten-Speed Commandments. He was co-creator (with Pittsburgh Post-Gazette cartoonist Tim Menees) of the nationally-syndicated comic strips, Cooper and Iota. Keefe and Mark Stevens, founded Running Meter Press to publish the novels of their late friend, Gary Reily. The Asphalt Warrior, first in a ten-book series featuring a bohemian cab driver named Murph, made the Denver fiction bestseller list in June, 2011. RMP has broadened its scope to publish other works of fiction as well. He played guitar and harmonica for the bar band, Falling Rock. Keefe has two grown children and lives with his wife in downtown Denver. He has no known allergies. Sardonika -- Making sense of nonsense and vice versa! Tim Menees -- Great Paintings! Sardonika: Making sense of nonsense and vice versa!